If you’re looking for a fun Friday night out that includes a great meal and a great show, then look no further! We’ve teamed up with our friends at Miller’s to offer their world famous traditional smorgasbord dinner, followed by our critically acclaimed Original Show, Broadway: Now & Forever, both for only $37.50 per person– that’s 33% OFF the regular adult price! Childrens’ price (ages 4-17) is $27.50. Select a Friday night beginning August 23*, and you can enjoy Miller’s award winning smorgasbord featuring mouth-watering American favorites as well as their own distinctive Heritage Dishes and bakery-fresh desserts…chilled steamed shrimp, top sirloin, breast of turkey, golden fried chicken, baked ham and fish, chicken corn soup, baked cabbage, bakery fresh cheesecake, shoo-fly pie, gourmet apple pie, and much more. Then, after dinner, come to AMT for Broadway: Now & Forever, an incredible show that pays tribute to the best of musical theatre, featuring 40 songs, 17 shows, and one unforgettable experience. Phenomenal vocalists, amazing dancers, and a full on-stage orchestra bring the music to life, while stunning costumes, lighting effects, and staging immerse you in the full Broadway experience. Our Friday Night Dinner & A Show Special Offer is available for purchase August 13-16, 2013 only, so don’t delay. Stop by our Box Office, call us at 800-648-4102, or purchase online at AMTshows.com. Please use code MILLERS when ordering. If you purchase this package online, a representative will contact you to schedule your dinner reservation. 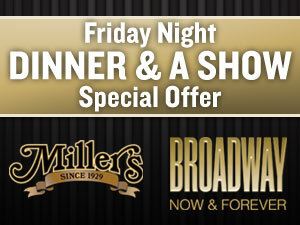 Come enjoy a great Friday evening out with Miller’s and AMT! Package offer available August 13-16, 2013 only. New orders only; Based on availability. Cannot be combined with other offers; Service fees apply. Must mention code MILLERS at time of purchase. Offer includes Miller’s traditional smorgasbord meal, non-alcoholic beverages, and tax. Gratuity not included. *Valid for Friday performances through 10/11/13. Excludes 8/16/13 and 9/13/13.